From significantly reducing your costs to offering a partnership through every step of implementation and daily use, Nitro Pro is the first and leading Adobe Acrobat alternative for a long list of reasons. Having been the leading Adobe Acrobat alternative for over 13 years, we have helped hundreds of thousands of businesses make the switch from Adobe. In fact, most of our customers come to Nitro to replace some—or, in many cases, all their Adobe Acrobat licenses. When talking with our customers, we listen to their experience with Adobe as a company and Adobe Acrobat as a product, offering helpful solutions and differentiated services to fulfill each organization’s needs. As experts in helping companies switch from Adobe, we have developed partner-driven solutions that empower our customers to overcome common difficulties with their Adobe Acrobat deployments. We don’t know your experience with Adobe—but if you’ve ever felt frustrated with any of the below issues, we’re here to help. Has Adobe Acrobat’s price tag prohibited you from equipping more users or consumed an unnecessarily large portion of your IT budget? Have you ever felt like just a transaction to Adobe? Or perhaps had difficulty receiving customer support for your Adobe Acrobat deployment? Have you ever worried about the prospect of software compliance audits and their impact on your budget and workforce? Have you ever been frustrated by Adobe Acrobat’s licensing structure and wished you could have more flexibility? Nitro’s affordable price point makes it realistic to equip every knowledge worker with tools for PDF productivity and unlimited electronic signatures. Offering powerful tools to create, convert, edit, and share PDFs, Nitro Pro equips users with the functionality they use most in Adobe Acrobat—and none of the features they don’t—for lightweight software that both end users and IT will love. By switching from Adobe Acrobat to Nitro Pro, our customers typically cut costs by at least 50%. With Nitro Pro, the intuitive Microsoft Office–style interface eliminates the learning curve so that even first-time users can accomplish their document workflows quickly and easily. Nitro’s lightweight software and skilled implementation experts make deployment simple and customizable for a wide range of desktop and server environments. 1 “Adobe Net Promoter Score 2018 Benchmarks.” Customer Guru. We work with our customers to create easy-to-understand, mutually beneficial agreements that fulfill each company’s unique business priorities. Unlike other software companies, including Adobe, Nitro has never audited a single customer—one of the many byproducts of treating every customer relationship like a partnership, not just a transaction. Always committed to protecting our customers’ data, Nitro follows Cloud Security Alliance (CSA) and NIST SP 800-53 standards. We are compliant with U.S. and EU eSignature regulations, and have secured SOC 2 Type 2, HIPAA, and Privacy Shield certifications for Nitro Cloud. Whether your users need basic PDF productivity features like creation, conversion, and editing or more advanced tools like batch processing and electronic signature workflows, the Nitro Productivity Suite is the best alternative to Adobe Acrobat Standard DC. If you're contemplating an alternative to Adobe Acrobat, make sure you strategically select the right solution for your organization. Here are a few resources to help. Use this checklist during your search to ensure you choose the best software vendor to satisfy your needs. 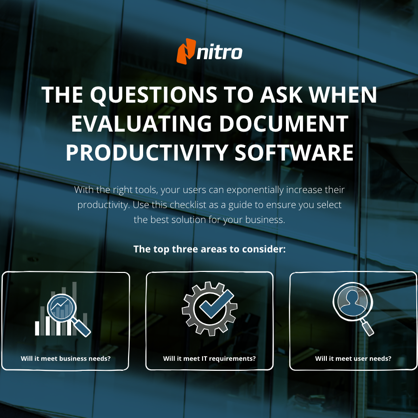 Discover why other organizations selected Nitro as their PDF productivity partner.